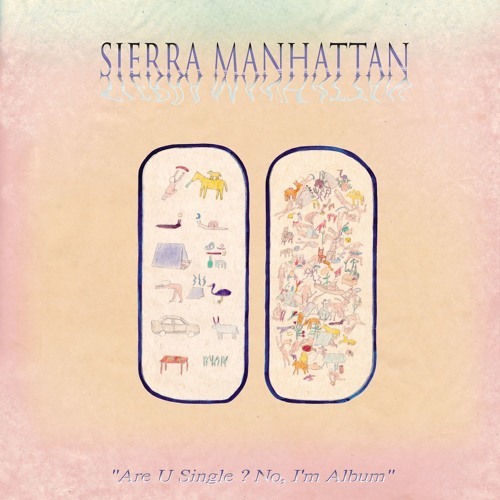 SIERRA MANHATTAN - Are U single ? No, I'm album Out October 9th 2018 ACAB02 - AB Records/ Atelier Ciseaux Order > http://www.atelierciseaux.com/shop/ // https://abrecords.bandcamp.com/ A1 - Sunless Days* A2 – Maggle A3 – Politics* A4 – On Our Own A5 – Videogames B1 – Everything's Fine B2 – Tuesday* B3 – One Love B4 – Now Or Never B5 – Duhspee* *brand new album version futur 3000 Sierra Manhattan is : « Flom's » Adrien - Drums & Percussions « Rem'd-m-i » Richarme – Bass Guitar « Jahlex » Van Pelt – Lead Guitar & Backing Vocals « Antoine » Sanka – Rythm Guitar & Lead Vocals All songs written & arranged by SM between april '12 and june '16. Victor Prunier plays chimes on « Now Or Never » Recorded in Chamelouze's « Chill Studio & Perma Recordings » by Antoine « Skanky » Nouel in March '17 Mixed by Antoine « Skanky » Nouel & Sierra Manhattan at Pluricité Studio 44, Lyon 7 Mastered by Ianis Robin-Mylord at Woodlark Studio, Saint-André De Corcy (01) Drawing by Roxane Métayer Design by Régis Turner Huuuuge thanks to : Rem'Ciseaux, Skanky, Sbaffus, Goldie, Matthieu « Oh My » Gaud, Regis, Roxy, Baggy, Accou, Lizzie, Pépino, Apolicarpio, Mo, TG, Marion W, Yan Errata, Hugdol Padique, Seb Barbap', Christophe Chaine, Weed, Kcdède, François Virot, FrenchFred, Steph, Nico, Cette Mechante Ambiance, Va Loup, Baptiste, Juju, Poyo and all the people that helped us in anyway !! !